If you’re like me at all, you’ve been waiting patiently for Tiger solely for the impending return of Quicksilver builds every few weeks. Luckily, Alcor is kind enough to have provided me with a developmental build (to be fair, everyone on #quicksilver has access, but I’m going to pretend), and gave me permission to drop some of the new feature flavor in your ear. Or in your eye, I guess. b40 is out now, so this is less of a preview and more of a review. Very new to Quicksilver, and the most noticable change since functionality was segmented into plugins back in b26, the plugins manager supplants the plugins page with an internal catalog and easy install method. Installing a plugin is now literally as simple as ticking the checkbox; the plugin will download and install almost instantly. As one would expect, there’s a Spotlight plugin in b40; there are two main functions I’ve found. 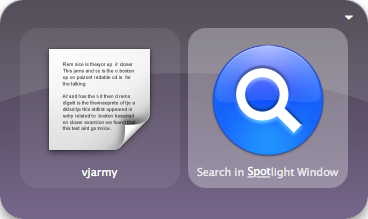 One is that there’s some Spotlight actions which lets you send queries to the Spotlight menu/window. New to the preferences is the Actions list, where you can enable/disable actions for various data types, as well as reorder the order in which they appear. I’ve already found this immensely useful to disable actions I never use, like suspend/resume for applications. 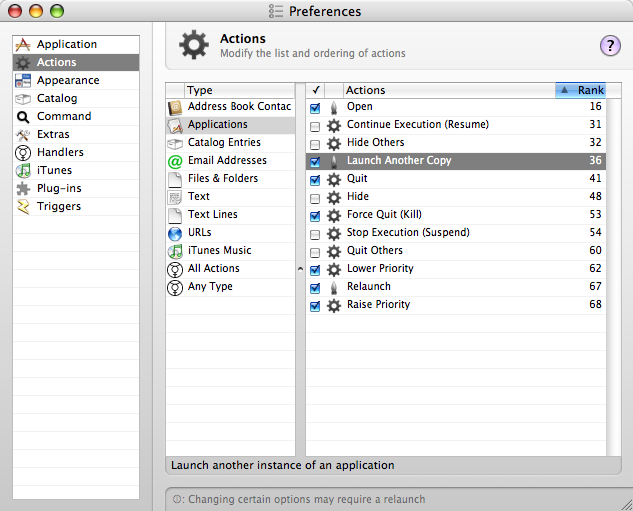 Once you install b40, you’ll notice some new actions in Automator. 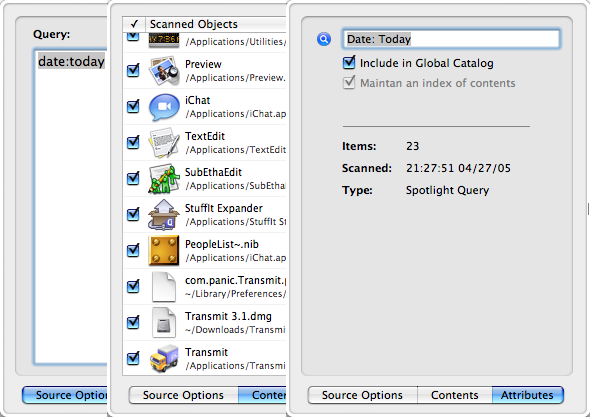 I haven’t played with Automator too much yet, but it’s good to know the power is there. 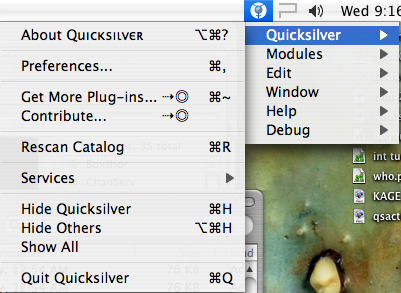 Quicksilver now has the option to have a “full menu”, which gives you almost every option you’d want under the menu item. 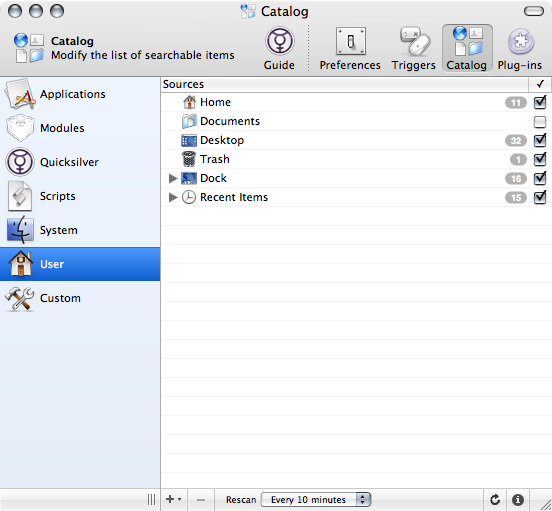 Now you can immediately jump to the plugin view, quickly rescan the catalog, and more. The Catalog is now slightly tidier; custom objects are always added to a new “Custom” group. Quicksilver b40 is out now! 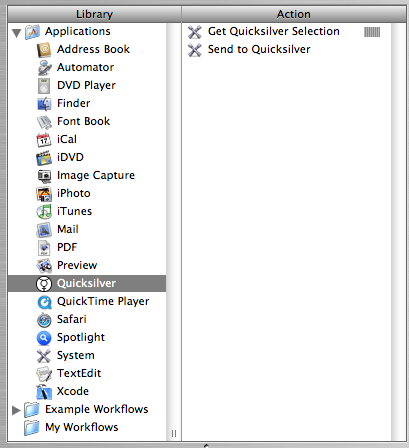 Be sure to grab it from the Quicksilver page. 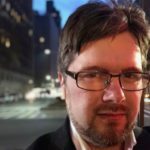 I’ve updated both my beginner’s tutorial and my intermediate tutorial to reflect the minor changes this new version causes.